Researchers discovered a Greek temple in coastal Albania dating back to the 6th century BC, according to the first public presentation of details surrounding their find on 6 January 2006. Albania became member of the North Atlantic Treaty Organization (NATO), an intergovernmental military alliance, on April 1, 2009. Vodafone M-PESA, the mobile payment solution that has transformed the lives of millions of people in many markets was launched on 5 May 2015 by Vodafone in Albania. This will enable the Albanians to send money to their friends and family, pay bills, buy airtime, in a safe, fast, affordable way, anywhere, anyplace in Albania. Albania and Qatar signed a Memorandum of Understanding (MoU) in the field of environment protection on 13 May 2012. The MoU stated that the two parties will co-operate with each other in environmental issues on the basis of security, equal rights and mutual benefit within the framework of their related scope of practice and legislations. The World Bank on 21 May 2015 endorsed the 2015-19 Country Partnership Framework (CPF) for Albania, which proposes a lending program of up to US$1.2 billion over a five-year period aimed at supporting Albania’s aspirations to achieve equitable growth and integration into the European Union. Smoking ban in Albania went into effect on 30 May 2007, banning smoking in all closed public places and advertising of tobacco products. Albanian football team made history on 20 June 2016 by sealing their first ever win in a major tournament by beating Romania 1-0 at the EURO 2016 football tournament. Historic Centres of Berat and Gjirokastra in Albania were included in the UNESCO world heritage list in 2005. Located in central Albania, it includes a series of outstanding houses, a castle, an 18th-century mosque and two churches of the same period. Its origins date back to the 4th century BC. Albania and the World Bank on 31 July 2014 signed a US$10 million loan agreement for an Environment Services Project. The project supports sustainable land management and aims to increase communities’ incomes in erosion prone rural upland areas in Albania. Albania secured US$150 million from the World Bank on 29 September 2014 for its power sector recovery and reforms. It is expected to improve the reliability of the electricity supply and the financial viability of the sector. Albania on 11 October 2015 qualified for the European Football Championships, to be held in 2016, for the first time in their history after they secured a 3-0 victory against Armenia. 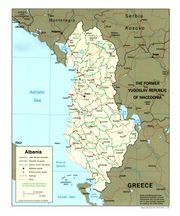 Albania topped the list of Lonely Planet’s top 10 countries for travel in 2011. The list was published on October 31, 2010. Independence Day of Albania. On the historic day of November 28, 1912 Albania became independent after the fall of Ottoman Empire. Albania was admitted as a member of the United Nations (UN) on December 14, 1955.